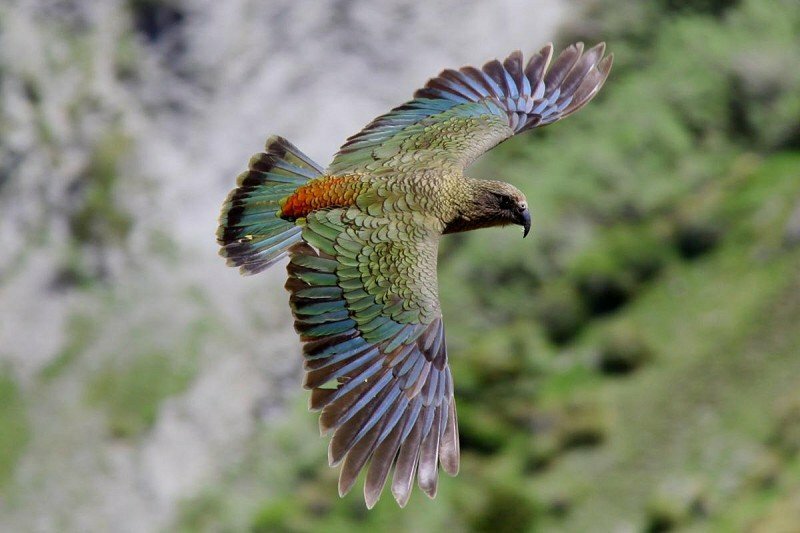 The Kea Database is a brand-new citizen science initiative from the Arthur’s Pass Kea Team. Browse the banded birds we have in our system, and help us out by recording your sightings when you see them around—not just in Arthur’s Pass, but anywhere in NZ! They work closely with the Kea Conservation Trust, Arthur’s Pass Wildlife Trust and the Department of Conservation. Both female and male Kea are alike in their green colour. They both have red plumage on the napes of their necks and underneath the wings which can be easily seen when they are in flight. The male has a larger and longer curving upper mandible (beak) than the female. Juveniles have bright orange-yellow around their nostrils and lower mandible. The total population of Kea has been estimated at about 5000. They live usually in alpine and bush-line country, feeding on a wide variety of berries, shoots and insect larvae. They are opportunistic feeders with a particular liking for fatty foods, hence their interest in public rubbish dumps and discarded food at skifields. Nests are usually on the ground (inside rock crevasses) with 3-4 eggs laid in July - August. 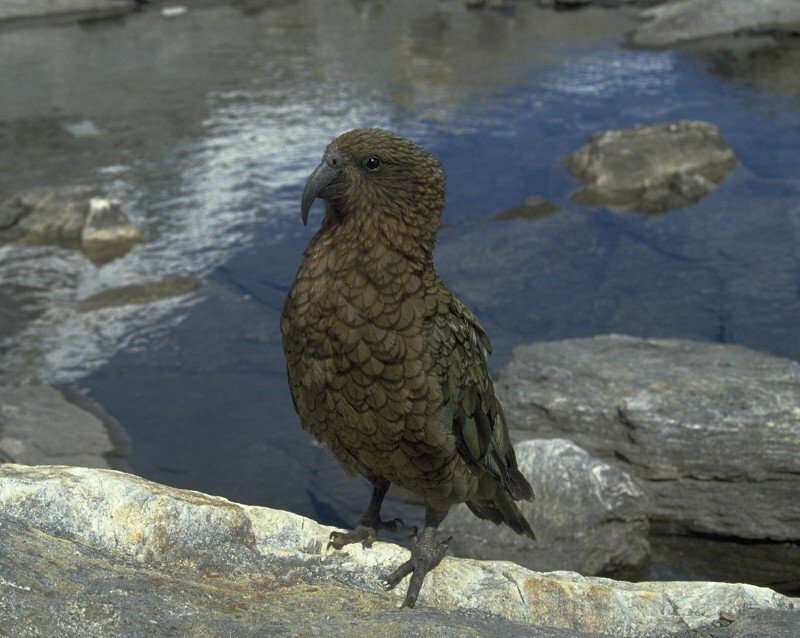 Kea are social and mobile, and young non-breeding males often form "street gangs" of 15-20 birds, particularly in alpine tourist towns like Arthur's Pass. KEA are found only in the high country and mountains of New Zealand's South Island. KEA are probably a threatened species (<5000). The best place to see a Kea, particularly juveniles, is up at the Viaduct Lookout at Death's Corner on Highway 73, about 8km west of Arthur's Pass Village. 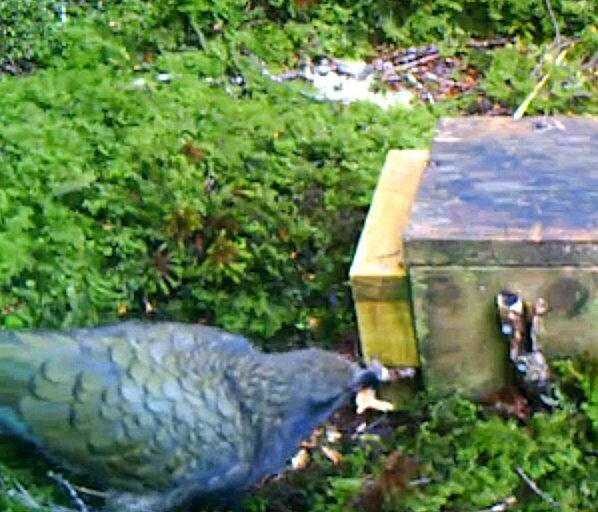 Feeding attracts Kea to areas of human use such as skifields, villages and car parks. Once in these areas they tend to get into trouble! They have time on their hands, as they are not foraging for natural foods and will eat toxic lead flashings and nails off older buildings as it tastes sweet to them. Natural food for Kea is mainly plant material, such as berries, roots, shoots and insect larvae. Human food is like junk food. Because human food has a higher energy value than a Kea's normal diet, a small quantity will provide the Kea with it's total energy requirements for the day. This gives them plenty of spare time to get into mischief. Feeding young Kea discourages them from looking for and learning about natural foods. They can become dependent on human scraps. Young Kea often flock together which makes the situation worse. By not feeding Kea they will move away from areas of human activity to forage for natural food elsewhere in the mountains and leave you and your possessions alone. Store your belongings where Kea cannot reach them. 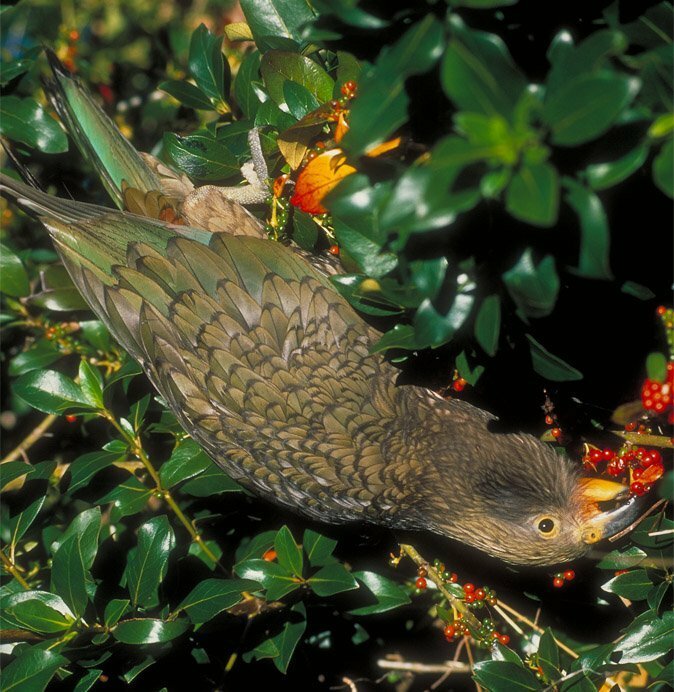 Kea are directly responsible for the effective seed dispersal of 12 percent of New Zealand's alpine plant species. Previously it had been assumed that the Kea's beak would break the seeds, contributing little to seed dispersal, however research by University of Canterbury PhD student Laura Young has shown that Kea selected more fruiting species, consumed more fruit and dispersed more seeds than all other birds seen in the mountains combined. Kea were the only species that made frequent long-distance flights within and between mountain ranges, which was vital for spreading alpine flora. With the decline of Kea numbers it is very likely that alpine plants could also suffer a subsequent decline in distribution. Kea love lead, it tastes sweet to their palate. Lead unfortunately is a heavy metal. Lead is very toxic and is rapidly lethal. Lead toxicosis affects the nervous system, Kea exhibit changes in responsiveness to environmental stimuli, loss of balance, inability to stand and seizures; commonly Kea are seen vomiting mass amounts of fluid. Kea source lead in Arthur's Pass frome roofs, and the wheel weights off cars. 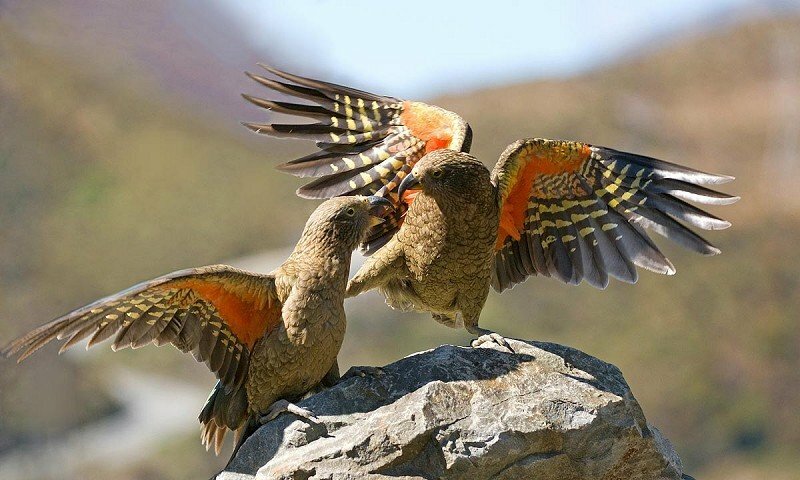 Kea need to obtain fats to survive in its harsh alpine environment. To this end Kea are known to visit the rookeries of coastal birds, robbing their nests of eggs or young chicks. While this sounds sinister, it is all part of the Kea's survival techniques, and has been going on for thousands of years. In the past it is thought that Kea may once have attacked the huge Moa for its fat resources. The Kea is very intelligent, and therefore can adapt quickly to environmental change. It is an opportunist, therefore conflicts as those mentioned below is not surprising. Kea once had a bounty on their heads, this causing a massive decline in the numbers of the species, and the contraction of their natural range back into the high alpine zones of New Zealands South Island. More than 150,000 were killed in the hundred years before 1970, when the bounty was lifted. 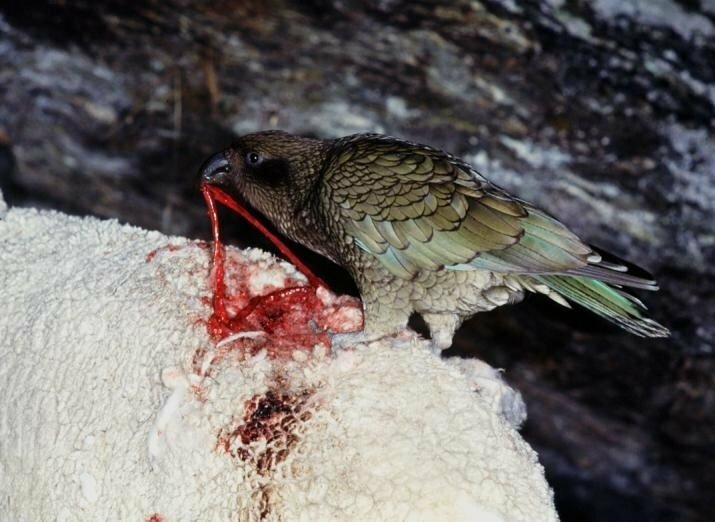 The original reason for the bounty was that it was discovered that Kea were killing sheep on the high country stations. The Kea had unwittingly caused the death of sheep through their insatiable appetite for fat. The Kea would peck at the sheep's flesh in the vicinity of its kidneys (a very fatty area) to obtain its feed of fat, this in itself did not kill the sheep, however infection would set in, eventually killing the sheep. It is theorised that this behaviour may have originated with Kea attacking the now extinct Moa for similar reasons. Modern management of a sheep station means that sheep are treated with antibiotics, and are more immune to infection. The Kea's range is also now so reduced that conflicts are less likely. Kea are known for their intelligence and curiosity, both vital traits for survival in the harsh mountain environment that is their home. Kea can solve logical puzzles, such as pushing and pulling things in a certain order to get to food, and will work together (collective intelligence) to achieve a certain objective. Kea have also been known to use "tools" to achieve results. Kea have been fashioning "sticks" to trigger multiple stoat traps in Fiordland and Arthur's Pass National Park, this behaviour appears to have been independently arrived at (See this News Article & Video). 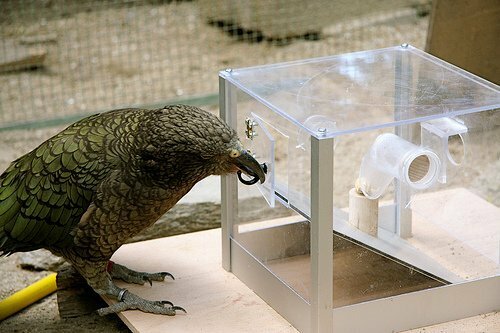 Kea have also been shown to be very adaptive in their problem solving skills, they will actively seek new ways to improve upon or speed up the solutions to any particular puzzle. 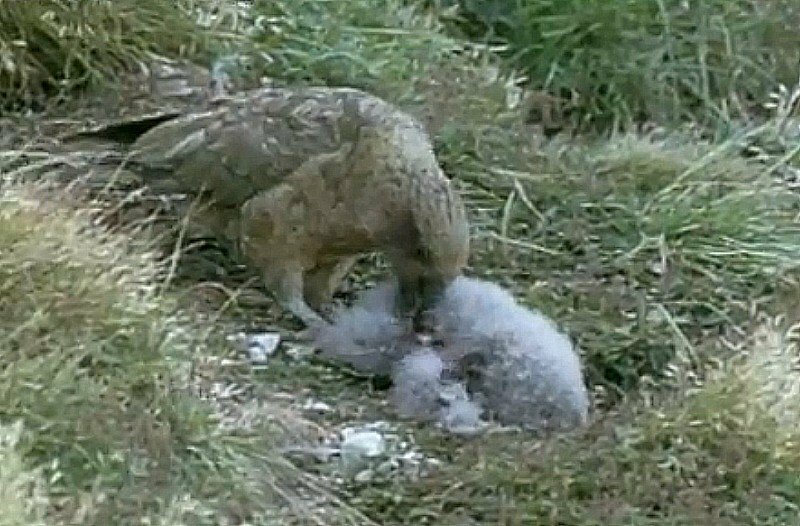 Kea will also teach behaviour learnt to other Kea very rapidly. For more information visit the Kea Conservation Trust.